During the time he spent with the media at Tuesday's American Athletic Conference UConn football coach Paul Pasqualoni wasted little time whenever he was asked the No. 1 priority for the Huskies during preseason camp. Time after time Pasqualoni said that the Huskies need to take better care of the ball as turnovers cost UConn multiple games in the previous two seasons. "I think there is a tremendous urgency to improve this year, we have to improve things like taking care of the ball, playing smart and not giving up a play here and there at an inopportune time on defense," Pasqualoni said. "We have been great on defense but we have also given up a play here or there on defense and we haven’t been good enough on offense to overcome those things. There is urgency to get those things done and if we get those things done the improvement will be there." Starting quarterback Chandler Whitmer also said that cutting down on turnovers is something he needs to improve on. As a sophomore Whitmer had a ratio of nine touchdown passes and 16 interceptions. With the return of six offensive linemen who started games for UConn in 2012, the top two receivers and leading rusher, all the pieces are in place for the Huskies to be an improved offensive unit. 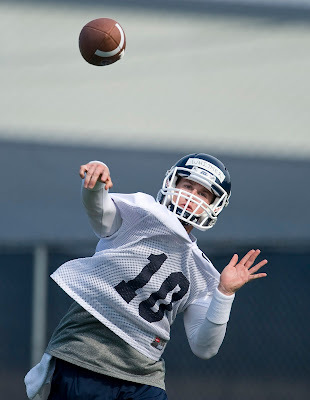 Whitmer knows he has to do his part and that begins with bringing a more mature approach to the quarterback position. That process shifts into high gear on Friday when UConn holds its first preseason practice. Whitmer had more games with multiple interceptions than he had with no interceptions. Whitmer knows that he needs to change that. Not only does he want to avoid putting the UConn defense in tough spots with costly turnovers but also wants to engineer more time-consuming drives to give the defensive stalwarts a chance to catch their breath on the sidelines. “That is something I am trying to back off of, taking a sack and not trying to force things,” Whitmer said. “Punting is OK. Live to play another down and field position is big. That is something I am really focusing on this year, I am getting back and watching tape. I’m trying to improve on different things.